Administration can deliver a registration code for new staff to register through Cloud. It can be found in the upper area of the staff detail page. Tip : Registration code should be delivered by paper or email. A registration code cannot be reused. 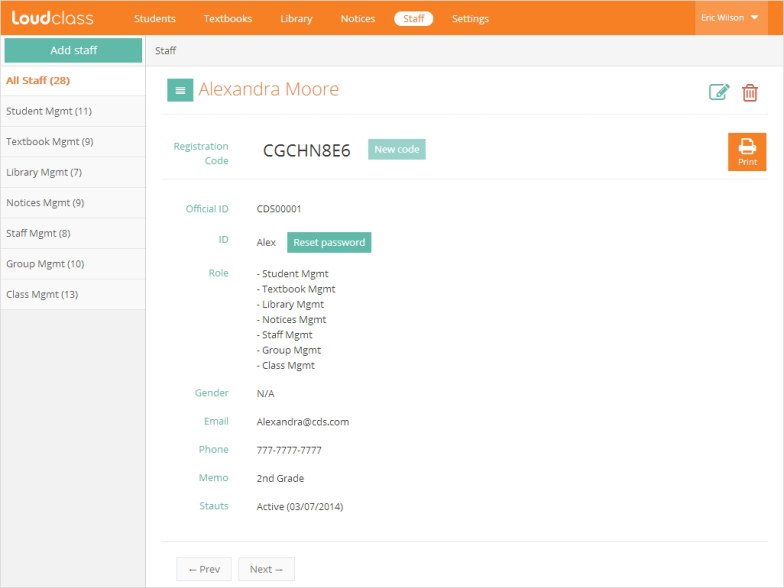 For class management staff (teacher), it can be used when registering through both Loudclass Cloud and Loudclass Interactive. Request the staff management staff for new code when needing to re-register the tablet. A new registration code can be issued from staff management staff by selecting the “New code” button in the upper area of the staff detail page. In case of a forgotten password, ask staff management staff for a temporary password. Upon reset, the previous password is deleted and a temporary password is issued. Tip : Temporary password should be delivered by paper or email.